Innovation is growing at a rapid pace, with some innovations, disrupting the market completely. New entrants are replacing incumbents from their position of leadership. In an analysis done by Thomson Reuters in 2014, it has been found that innovative companies have outperformed Standard & Poor’s (S&P) 500 companies- for four consecutive years. As per their analysis, the top 100 global innovative companies generated annual revenue of around US $4 trillion in 2014. While the S&P 500 companies showed an increase of about 4 per cent in R&D investments, the investments of innovative companies increased by around 17 per cent. What are the cultural traits of the present fast innovating and slow innovating companies? Are there similarities and dissimilarities in the cultures of companies that innovate constantly? 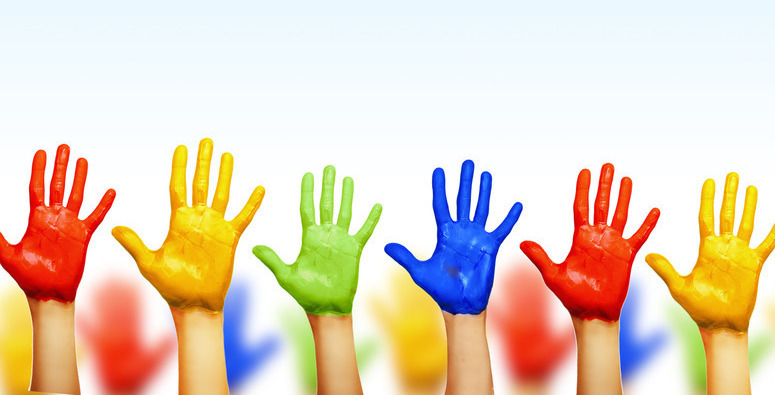 What cultural attributes or traits can impact innovation? Can change in leadership cause change in culture? The research methodology was based on the case study methodology and was focussed on four companies that have been very involved in the technology sector: Apple Inc., Google Inc., Nokia Corporation and Microsoft Corporation. The analysis was performed against the backdrop of the Competing Framework for Culture (Quinn, & Rohrbaugh, 1983), from 2000 until 2014. A cross analysis of these companies was done to understand the common and dissimilar cultural traits. Seen in the figure below is the segmentation of the mentioned companies as per their flexibility (control) levels and focus (internal versus external). Fast innovators are risk-friendly. These companies allow their employees to work on ideas, which, if accepted, could become marketable products. They are tolerant to failure. On the other hand, less or slow innovators possess a culture that is risk-averse. The fast innovators have had visionary leaders, throughout the organization. This has helped the companies to look beyond the present and focus on unexplored areas, thereby building entrepreneurial culture within the companies. On the other hand, the slow innovators initially possessed entrepreneurial cultures, but with the change of CEOs, the goals and strategies became short-sighted. The CEOs focused on financial figures and created a strategy that launched products help reach the financial goals of the company, as quickly as possible. 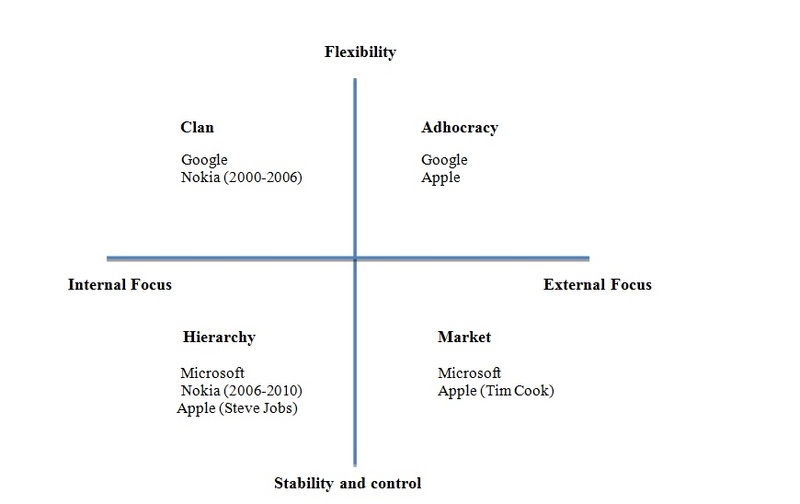 There is a clear problem of bureaucracy in the companies like Nokia and Microsoft. The middle management created silos, thereby creating communication gaps within the organizations. On the other hand, in Apple and Google, there was direct communication between the executive management and the teams. There was transparency within the organisations, thus making information readily available. Fast innovators based their focus on radical innovations. These innovations helped the companies to displace the incumbents in the market and remain leaders for a long time. The slow innovators, though being innovative, focused mainly on incremental innovations that created products that were not differentiators. Amongst the fast and slow innovators, a common aspect that can be observed is their investment in R&D. But the differentiating factor is the conversion rate of innovations into marketable products at the right time. In the case of Nokia and Microsoft, though they were innovating to a certain extent, these companies remained behind their competitors. This was mainly due to their slowness in converting innovative ideas into commercial products. The fast innovators invested well in hiring excellent resources and provided an environment of transparency. The employees were part of the decision-making and ideation processes, which made them, feel committed to the companies. On the other hand, there were internal politics and job insecurity in the slow innovating companies. This inhibited the ideation processes, as employees worked to gain visibility and keep their jobs. Quinn, R. E., & Rohrbaugh, J. (1983). A Spatial Model Of Effectiveness Criteria: Towards A Competing Values Approach To Organizational Analysis. Management Science, 29(3), 363-377.